If you have read the last post you may be wondering what I like to do with the gluten. My favourite way to use gluten or seitan is to fry them in oil till they puff up and golden. Then they can be stuffed and/or braised. 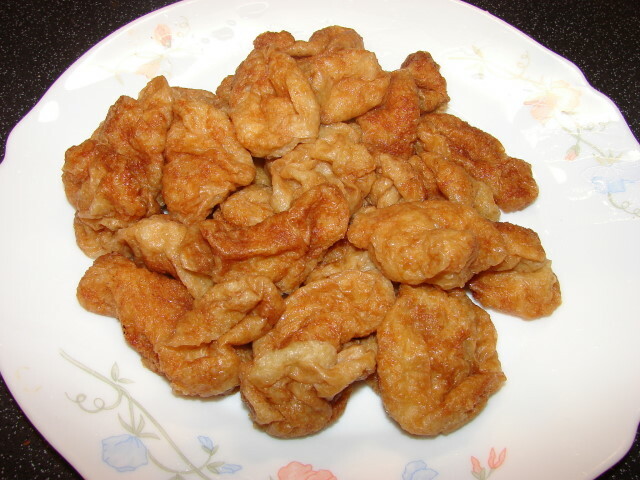 Fried gluten has a lovely nutty flavour, chewy and spongy. 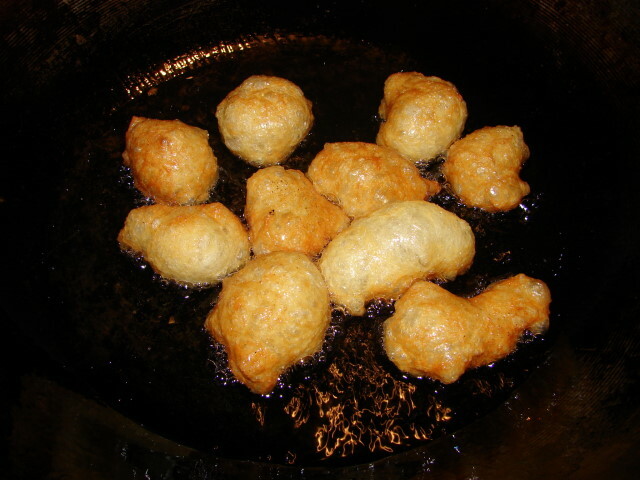 If you have eaten fried tofu puff, fried gluten is similar to fried tofu puff in texture and taste. Here is how to fry the gluten. First cut a lump of raw gluten into pieces. For the recipe below I used about 280g. Divide the pieces into 3 batches. Next put in about 1" deep of oil in a wok or frying pan. Heat the oil for about 1 minute at medium heat till medium hot. if the oil is very hot, soon as you put the gluten in, the hot oil will spit because of the water content in gluten. Drop in one batch of gluten pieces one by one. 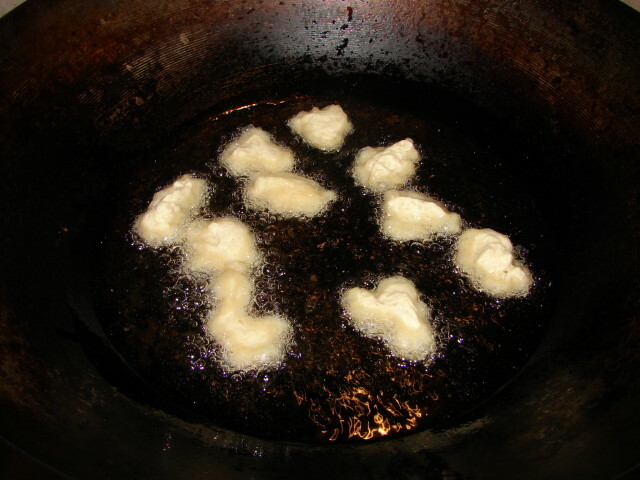 Remain heating the oil at medium - medium low heat, as long as the pieces sizzle evenly it's fine (see picture above). Keep turning the pieces, you will see them puffing up to 2X - 3X. Once they puff up, you can then increase the heat a bit more. Fry them till golden then remove. 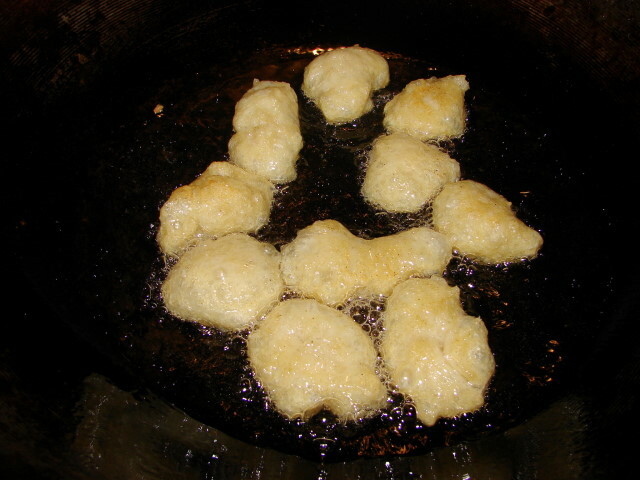 When you fry the second or third batch, the oil at the beginning should be very hot. Turn heat off first then drop in the pieces, when the gluten pieces stop sizzling rapidly then turn the heat back up to medium - medium low and continue as before. Here is a plateful of puff balls from just a handful of raw gluten. They are crunchy and hollow. How to use fried gluten puff balls? You can stuff them with anything you like, with a veggie stuffing of chopped mushrooms (any type), bamboo shoots, water chestnuts, potato, carrot etc.... 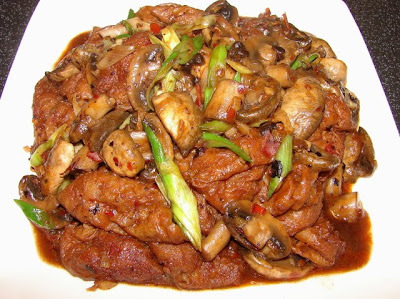 If you are meat eater can stuff with ground pork mix with shitake and water chestnuts, or add in some mince prawns is also very nice. If you have some fish paste this is also great as stuffing. Once stuffed they can be steamed or braised. Normally I like to soften these balls with boiling water, when the balls are softened then pour off the hot water and refresh with tap cold water. Squeeze the pieces to release excess oil, remove the water. Here is the result, they are soft, chewy and smell wonderfully nutty. This is one recipe I like, is to braise these puff balls with mushroom with a chilli bean and black bean sauce. Fry about 280 - 300g of raw gluten as instruction above. Then soak, soften and remove excess oil. Take about 300 - 350g of common white mushrooms or chestnut (brown) mushrooms, cut into thick slices or bite size. Chop about 2 -3 cloves garlic. Also chop a small piece of ginger. Clean and slice about 3 - 4 stalks of spring onion or scallion. Have about 1.5 - 2 tbsp chilli bean sauce (douban jiang) ready. I like to use Pixian. You can sub chilli bean sauce with yellow bean sauce with a little minced chilli. Other ingredients include some cooking oil, dash of cooking wine, a little sugar, vegetarian oyster sauce or light soy (optional), little sesame oil, about 1 tsp of cornflour dissolve with a little water, and finally some water for braising. Heat few tbsp of oil in the wok. Add garlic and ginger, stir till fragrant. Add in the chilli bean sauce and black beans. Continue stirring for a while. Then add in the gluten and mushroom. Stir fry for a couple of minutes. Add in cooking wine, stir then add in about 1/2 - 3/4 cup of water. Let this braise for about 10 minutes till hot and bubbly. Taste for saltiness, if not enough can add some vegetarian oyster sauce or soy sauce and some sugar to taste. Thicken with slackened cornflour. Finally add in the spring onion and dash of sesame oil. Will post more ways to use gluten and recipes later. Thank you for sharing your knowledge. I hope to try it someday. It seems like a daunting task but worth learning. 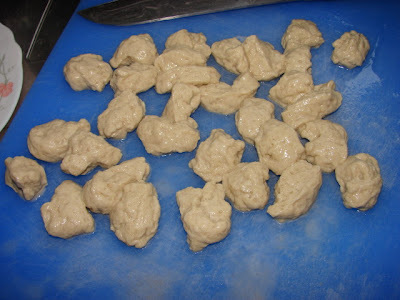 Can I have ur recipe for making (ingrediants )gluten puffs? 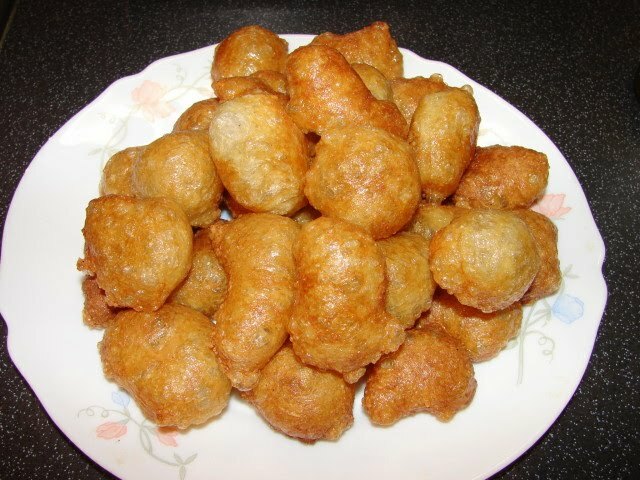 I've tried some from the net but no sucess!Ur puffs look like those sold in M'sia. Do you know how to keep them crispy @ round ?Have a nice day. Pls see previous post how to make gluten from scatch using bread flour. Or you can try using pure gluten flour mix with water, have not tried it so don't know any good. Hi! I was very happy that your recipe is so detailed, but my gluten puffs didn't puff enough :( The outside was puffed, but the inside was like cooked Seitan. When I softened them, the inside remained and so they weren't like I remember them from Buddhist restaurants in Shanghai. Do you have a suggestion? My oil wasn't very hot, in the beginning it barely sizzled. Do I have to turn them constantly? I always waited a while, turned them etc. I made them from gluten and added some spices (like in this recipe: http://lilyng2000.blogspot.de/2009/03/homemade-gluten-puffs.html), perhaps there's too much water in them? Did you make the gluten from scratch by washing a strong flour dough or with pure gluten flour? I have only made fried gluten the traditional way, if you made it with gluten flour I really don't know this will work deep frying. Another thing is how big piece is the raw gluten before frying they cannot be too big best about 2cm. Also did you follow my tip frying at low heat first, must keep turning till puff up before turning the heat up. These puff balls are hollow but don't expect the same lightness like those huge hollow balls you get from the Chinese supermarket. Hi just noticed another point you made with oil temperature. This need to be low medium hot, the pieces need to sizzle lightly in order to give enough heat to puff the gluten but you don't want it sizzle rapidly because if it is too hot the gluten will cook inside and remains solid before it gets the chance to puff. Try with few pieces at the time till you get the hang of it. Good luck!